As we close out the holiday season, the Nerdy Chicks wanted to share some nerdy, fun, creative things to make your days more merry and bright. All you need are some books and some imagination (and scissors, hot glue, etc. — but that doesn’t sound as musical, does it?). These are not just holiday crafts — these gorgeous paper flowers are good all year long. 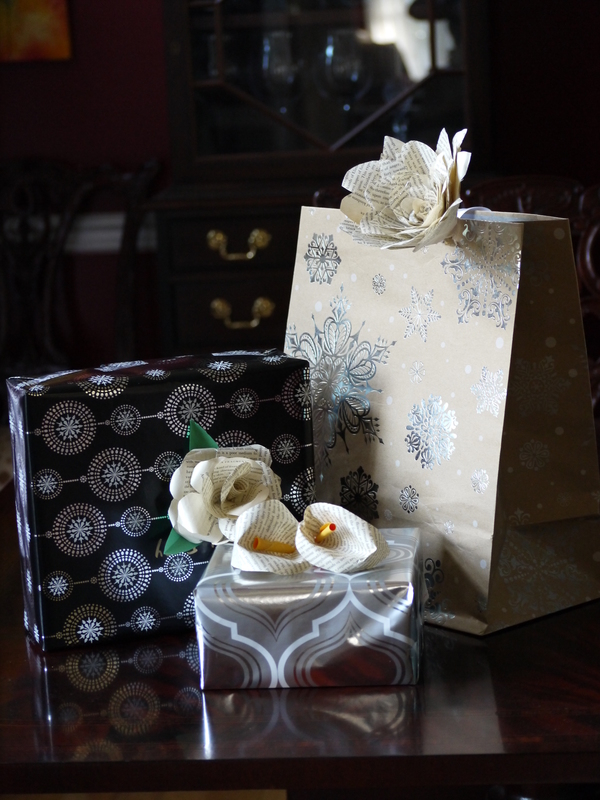 There are many different types of flowers that you can make, from roses to orchids to calla lilies and more! The petals are cut out of old book pages and hot-glued (make sure you use a low-temp glue gun) onto a toothpick or piece of wire. Sudipta uses these as bows on wrapped presents or glued onto alligator hair clips to make great tree ornaments. For some examples of different paper flowers you can make, visit the Elli Blog. These are easy to make, and we love the way they look. Basically, you just cut circles from the pages of old books, then thread them onto a dowel or skewer. Kami used vintage wooden spools for the trunks. 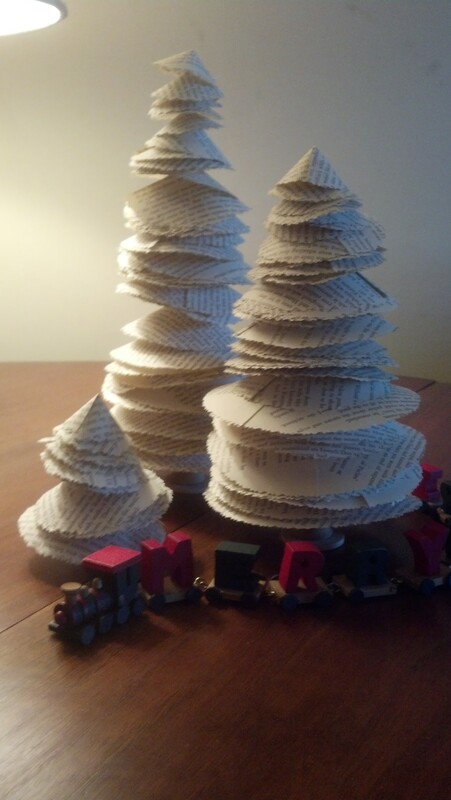 You can get full instructions on how to make these, and other types of book-trees here. This was Sudipta’s favorite 2013 book craft. 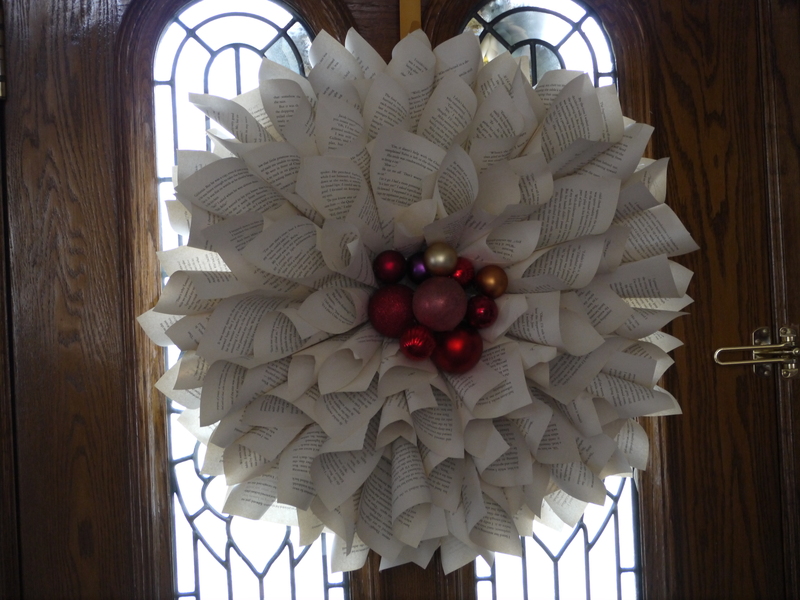 Pages ripped from a book, rolled into cones, and glued onto a cardboard circle, and VOILA! Instant masterpiece! (And by instant, I mean three hours later. But, hey — totally worth it!) 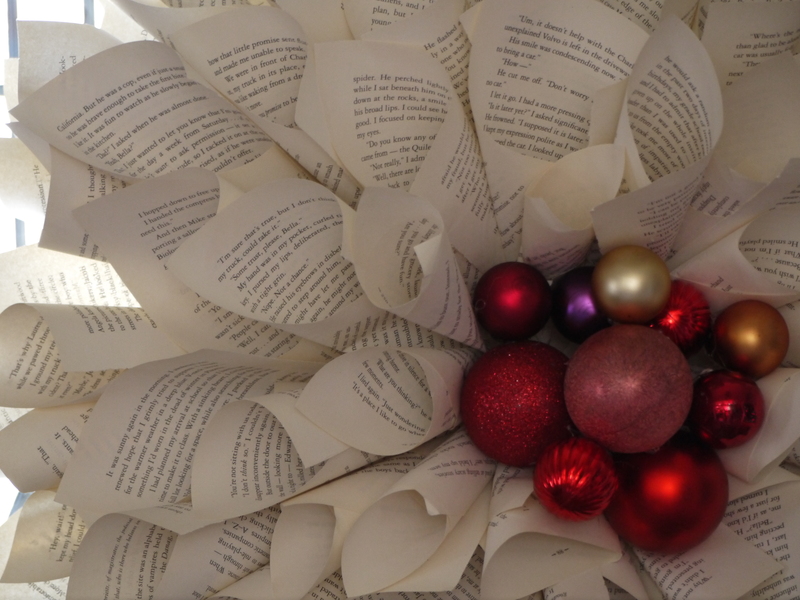 For instructions on how to make a similar book wreath on your own, visit this site. 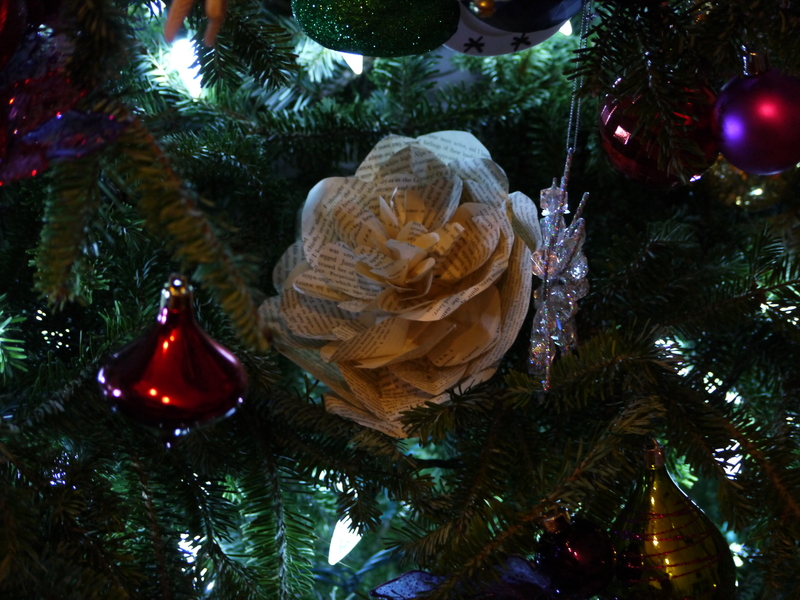 This entry was posted in Uncategorized and tagged book, christmas tree, craft, DIY, paper flower, tree, vintage, wreath. So cool! I love the way these old paper crafts look. Just found your blog and am excited to read more! Happy to have you – stay a while! It hurts me to tear up a book, but I love the effects! And I’m grateful it was you, not me, who took 3 hours to create this masterpiece! How gorgeous!!! I thought I was the artist in this group. I’ll have to remember the flowers for my book exchange with my book club next December. Are you making some kind of statement by turning Edward and Bella into a wreath? I think the trees could make a perfect year round decoration for writing inspiration. Have a Creative New Year! Thanks, Mary! I used Twilight so that my girls wouldn’t read it! Finally, I can put all those rejection letters to good use! 🙂 Happy, happy holidays! Oh, that’s a FABULOUS idea!